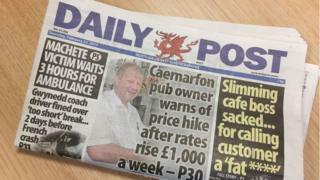 The Daily Post is now Wales' best-selling regional newspaper, although the print sector remains in long-term decline. Figures for 2016 show the paper, which serves readers across north Wales, sold an average of 22,251 copies. It is a decline on the 23,645 printed copies sold in 2015. The Daily Post's circulation has overtaken the Swansea-based South Wales Evening Post. which had an average circulation in 2016 of 21,031 copies. This also saw a decline in the number of browsers of its website. But there was an increase in online visitors for most other titles, though they continue to struggle to generate the kind of income for publishers which can replace the sales and lost advertising revenue of newspapers. Wales Online's audience grew 13.1% to reach an average of 292,824 daily unique browsers, according to the latest ABC figures. The Daily Post's website grew 5.1% to reach 81,125 daily unique browsers. The Western Mail, which styles itself as the national newspaper of Wales, saw its circulation fall to 15,697 copies in 2016, down from an average of 18,063 the previous year. The South Wales Echo's circulation hit 15,140 compared to 17,820 in 2015. There was an average circulation of 10,808 for the Newport-based South Wales Argus, which declined from 11,475 in the previous year. The Wales on Sunday also lost readers, reaching an average circulation of 11,608 last year compared to 14,314 in 2015. A spokesman for Trinity Mirror said: "Media Wales reaches over half the population in Wales, through its daily and weekly print titles and Wales Online. "We have 247,000 people reading our newspapers every day and 3.6m monthly unique visitors to Wales Online." 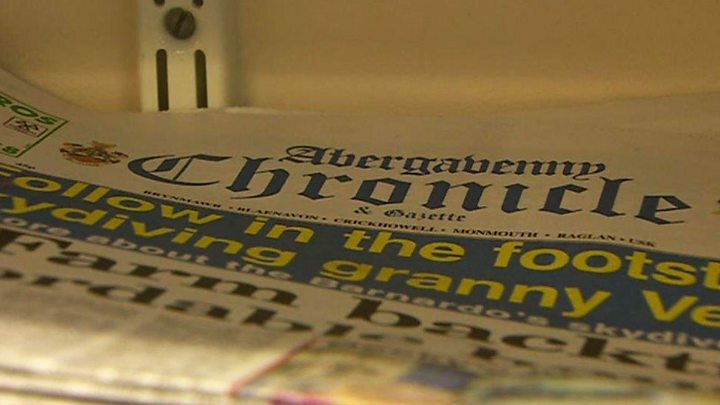 Kevin Ward, former South Wales Argus editor, said: "Newspaper sales have been declining for 50 years but that rate of decline has been much faster over the last 10 years since people have turned to online news. "The audience is there - people still want local news and are interested in what's around them, but there is a generation coming up used to getting their news free online and the challenge is how to monetise that." He said online advertising now was "incomparable" to five years ago but online revenues were still only around 30% of overall revenues, with the rest coming from print advertising and circulation. Mr Ward said the biggest concern for journalism was the scale of job losses, which had almost reached a tipping point. Media captionLiz Davies, editor of the Abergavenny Chronicle, said there is still room for traditional local newspapers. He added that there were so few working on some newspapers they could not do their jobs in holding those in power to account and "to ask the questions which needed asking". Liz Davies, editor of the weekly Abergavenny Chronicle, said the industry was still wrestling with the online challenge. "Now there are so many different outlets - Facebook, Twitter, the general internet local news sites - for people to pick up information for nothing," she said. "The danger is they only come to us when there's a problem and really if you don't support the local press in the good times we won't be there in the bad times." Will the closure of district office impact Wales' newspaper industry?